It's rare that the forecast is quite so minging before a meet and I wonder if some had had a premonition as numbers were sadly down on this meet. 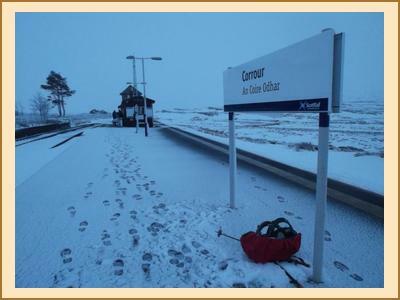 Nevertheless Harry, Kenny, Ian L and Alan H blazed the trail on Friday, catching the early train to Corrour and getting a walk over Meall na Lice in before the minging stuff came through. The rest of us followed in slightly more haphazard fashion from Crianlarich. Tim, newbie Firat and I settled down for a gourmet dinner at the Crianlarich Hotel but hadn't anticipated a rush on the kitchen and ended up literally running from the establishment with dinner "to go", flinging the car unceremoniously into a gap with not much time to spare before the train set off. Several were impressed that Clare A had made it in time. There were three groups at the beginning of Saturday; the largest crossed the railway line and walked up and down a few times through deep snow trying to find a suitable ascent route for Leum Illeum. Ian L doggedly continued and managed to summit in foul conditions, returning along his outward route; the others returned for a cuppa and rethought their strategy. Kate, Allan, Miriam and Adam tried their luck along the south side of Loch Ossian whilst Firat set of determinedly for Beinn na Lap armed with Red Bull. Clare A - full of cold as she was - and Kenny opted for Beinn na Lap; Clare mused that "when you wear man trousers, they always try and undress you". I'm not sure why this may be, Clare, but you didn't need any second bidding to get your kit off and go for a swim in the loch! Monty was also persuaded to go in for a dip and according to some accounts they managed a couple of laps (I assume of a standard swimming pool, not of Loch Ossian). 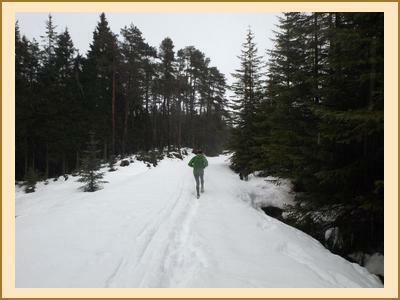 Harry got out his XC skis and did a bold 24km route across the moor towards Rannoch Station and back. Having used his skis the day before too he definitely got his money's worth; Tim's remained unused and I'm not sure how much pleasure he got from lugging them to and from the hostel. Tim, Alan R, Alison and I meanwhile set off along the south side of the loch; Tim and I to attempt a Munro I've not yet been up - Sgor Gaibhre. This involved a great deal of post-holing, bog scrambling and an into-the-wind slog up the northern aspect of Meall Nathrach Mor, requiring a compass bearing or two to locate the summits of Sgor Choinnich and the Munro itself, and we followed our tracks on the return route, before the seemingly interminable ploughed track along the north side of the loch back to the hostel. Alan and Alison sought two Munro tops in the direction of Beinn Eibhinn and whilst they enjoyed relatively scoured slopes on the ascent route, the second summit was by all accounts horrendous, with driving snow/rain and tough conditions underfoot too. Alison sensibly crawled straight into bed on their return to the hostel. Sunday's forecast - lovingly hand-written by custodian Jan - was positively cataclysmic and Harry, Monty and t'other Clare perhaps wisely decided to return to Edinburgh early, disappearing into the night on the Saturday evening train. I was fairly convinced that the wind turbine would fly off during the night and after one peek outside in the morning I went back to bed for another few winks; even the breakfast club (Ian, Allan S and Kate) remained in their dorms until after 8am. Alan R and I skittered off around the loch to attempt an anti-clockwise sub-1 hour circuit in our runners. I think we did pretty well completing it in 1h07 given the knee-deep snow on the southern side and the 50mph winds on the return leg! We also stopped briefly to pass the time of day with Allan, Kate, Firat, Miriam, Adam who circumnavigated the loch, in a clockwise direction, and at a more leisurely pace. Alan H, Kenny, Alison, Adam and Tim went off to find Peter's Rock, found several likely candidates and then did a traverse of Meall na Lice (Kenny's second ascent in 3 days), finding an interesting gully feature too. We all hunkered down in the hostel for the afternoon to wait for the train; Alan H set to repairing the drying rack which had been overcome by all the damp stuff and Kenny's overzealous hauling; I had a game of speed scrabble with newbie Miriam and Ian L. The 1-mile walk back to Corrour was harsh, facing into the wind; and we must've looked odd to the folk already on the train. That was nothing compared with what we saw when we shunted into Crianlarich: a load of hen partygoers, complete with "inflatables" standing on the wet platform. Apparently they hadn't realised that the train would stop there and they would have to get a replacement bus back to Glasgow. Fortunately I didn't suffer a repeat of last year's Easter meet: my car was intact when I returned to it. Loch Ossian remains a friendly and jovial location for a meet and even a bit of bad weather didn't spoil an enjoyable weekend. Thanks all.